As homeschoolers, we all want to give our kids a well-rounded education. Most of us have core subjects like math and science included in our day-to-day plans, but what about areas that aren’t your strongest or areas that you never learned yourself? You know, areas like music. How on earth do you teach music in your homeschool when your musical understanding is limited to what’s on Spotify? If you’ve asked those questions before, know that you’re not alone. Teaching music in your homeschool may seem intimidating, but it doesn’t have to be. Today I’m sharing five easy ways to teach music at home. You may be wondering if you even have time to teach music in your homeschool. I hear you. That’s why you need to start with SQUILT (Super Quiet UnInterrupted Learning Time). SQUILT makes it easy to add music to your homeschool days because it focuses on one piece of music at a time. That said, these affordable volumes are divided into musical eras and have ten lessons each. Teaching instructions, definitions, notebooking pages (my kids LOVE these), and links for listening are all included. Seriously, everything you need to teach music in your homeschool is covered with SQUILT. If you haven’t checked into this fantastic resource, now is the time! You don’t have to spend too much time around here to know that I’m all for introducing topics through picture books. I’ve found with both of my kids that picture books are not only informative and entertaining, but they also go a long way in piquing curiosity and getting them ready to learn more. As an added bonus, if you’re trying to do something out of your comfort zone — like teaching music — picture books are gentle way to get started. This approach is fun for adults and children and is a great match if you’re overwhelmed with the idea of starting with curriculum. Need some reading ideas? I share some great children’s books on music appreciation here, but my favorites on that list are The Story of the Orchestra and My First Classical Music Book. I’ve always heard that the ukulele is the perfect beginner’s instrument. And, since my big kid was searching for an instrument to learn, we got him a green uke for Christmas. Now you know why it was a relief to find this ukulele course from Raising daVinci. Friend, it didn’t disappoint. He’s playing this instrument now! Better yet, my kiddo learned music theory and is playing from ear. Needless to say, taking advantage of a course like this is no-brainer if you’re looking for a way to include music in your homeschool! Love this boy and all the progress he’s made on his ukulele. ??? Zeezok Music Appreciation is another great way to teach music in your homeschool. It’s particularly a good choice if you’re looking for something that encourages independent learning. This music appreciation curriculum covers the lives and works of seven composers (Bach, Beethoven, Mozart, Handel, Haydn, Paganini, and Schubert), teaching music theory basics in the process. An added bonus is that it’s divided up into units on each composer, making it easy to find stopping points and approach music from a unit study perspective rather than a constant in your homeschool schedule. Also worth noting, in addition to the main Zeezok worktext, it uses information from these biographies on the composers in the beginning of each lesson. These books are fantastic reads, but they do increase the cost of the curriculum quite a bit. If the cost of adding a music curriculum is a concern for you, you’ll want to keep that in mind. 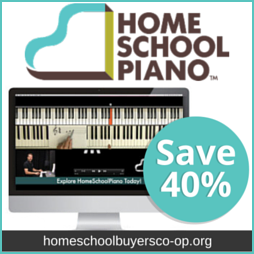 This is the only way to teach music that I haven’t personally tried, but this Homeschool Piano e-Course looks great. The course works for children of all ages, teens, and even adults and is accessible on multiple devices. I especially like that the course is designed to take students beyond basics. In fact, it takes most students more than 18 months to complete. If you’d prefer a less-costly option for learning piano, you may find Simply Music’s Learn at Home program to be a better fit. These lessons are accessed via steaming and typically have students playing piano rather quickly. You can learn more at Simply Music’s website, but you’ll want to purchase through Homeschool Buyer’s Co-op. After all, it’s 35% less if you buy it through the co-op. It’s your turn now. Do you already teach music in your homeschool? What resources have helped you the most? I’d love to hear your thoughts in the comments below.